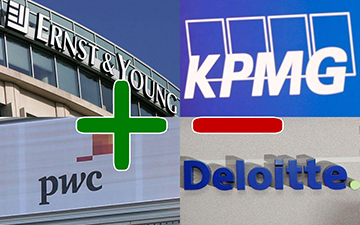 TORONTO, March 15, 2019 – Accounting giant KPMG Canada led the Big Four in net audit gains for 2018, according to SEDAR analysis provided to Canadian Accountant by Audit Analytics, an independent research provider based in the United States. 2019 marks the third consecutive year that Audit Analytics has provided its annual data analysis of auditor changes in Canada exclusively to Canadian Accountant prior to publication. This year, we are separating our reports into Big Four clients gains and losses, with a subsequent report to be published on the mid-tier market. With 26 new client gains and 10 client departures, KPMG Canada posted a net total of 16 gains, far outstripping its rivals in the audit industry. KPMG Canada also scored the highest gains in total audit fees ($12.4 million, all figures in Canadian dollars) and the total market cap of its new clients ($122 billion). Its mammoth gain in market cap was driven largely by oil patch giant Suncor ($88.6 billion market cap), which filed a notice of change of auditor on August 1, 2018 with the U.S. Securities and Exchange Commission. KPMG Canada’s leap was also driven by two cannabis companies, Aurora Cannabis and Canopy Growth, with market caps of $12 billion and $13.1 billion respectively. The cannabis market is a common theme throughout the gains and losses for the Big Four in 2018. The accounting practices and valuations of the cannabis industry have come under scrutiny from a wide range of critics. These include both cannabis industry executives and Canadian Accountant columnist Al Rosen, a critic of international financial reporting standards. However, the legalization of marijuana in Canada is a boon to Canadian accounting firms, which have benefited from a new sector of client companies to audit. The Big Four accounting firms and their foreign affiliates audit approximately 98 per cent of all Canadian reporting issuers by market capitalization. When a change of auditors occurs at a large cap company, it almost always occurs from one member of the Big Four to another, as was the case of Suncor in 2018. In addition to its cannabis companies, KPMG also landed a diversified range of public companies in the $1 billion market cap group. Coming soon, Canadian Accountant will report on 2018 audit client gains and losses in the mid-tier market. The full data on audit client gains and losses will be published next week by Audit Analytics. We will inform Canadian Accountant readers through social media when it becomes available. Read the 2017 report from Audit Analytics here. 2018 Client Gains and Losses are provided by Audit Analytics, which provides insight into the Canadian audit marketplace through market intelligence, due diligence, compliance monitoring and trend analysis. Its Canadian databases provide detailed research and expert analysis on nearly 4,000 companies filing with SEDAR. Contact them through 508 476.7007 or info@auditanalytics.com.